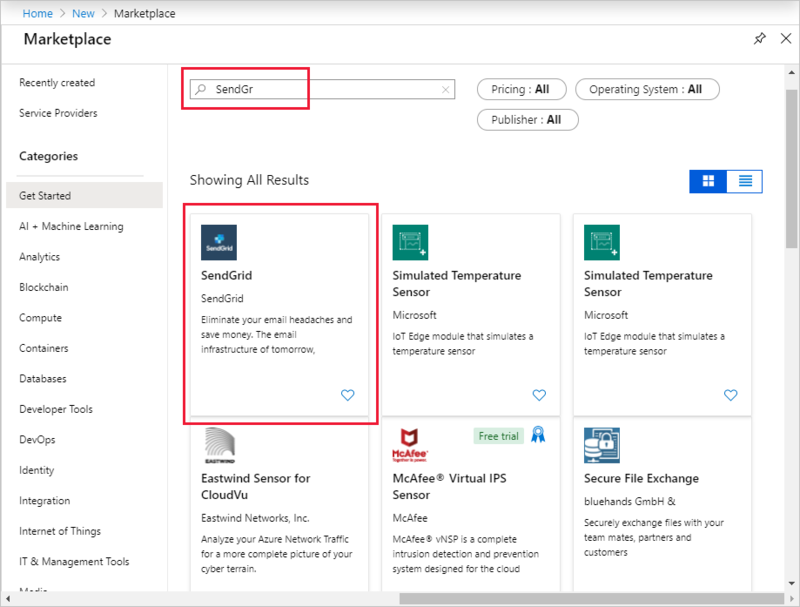 This guide demonstrates how to perform common programming tasks with the SendGrid email service on Azure. The samples are written using the Node.js API. The scenarios covered include constructing email, sending email, adding attachments, using filters, and updating properties. For more information on SendGrid and sending email, see the Next Steps section. What is the SendGrid Email Service? For more information, see https://sendgrid.com. Azure customers can unlock 25,000 free emails each month. These 25,000 free monthly emails will give you access to advanced reporting and analytics and all APIs (Web, SMTP, Event, Parse and more). For information about additional services provided by SendGrid, visit the SendGrid Solutions page. In the menu on the left, click Create a resource. Click Add-ons and then SendGrid Email Delivery. Complete the signup form and select Create. 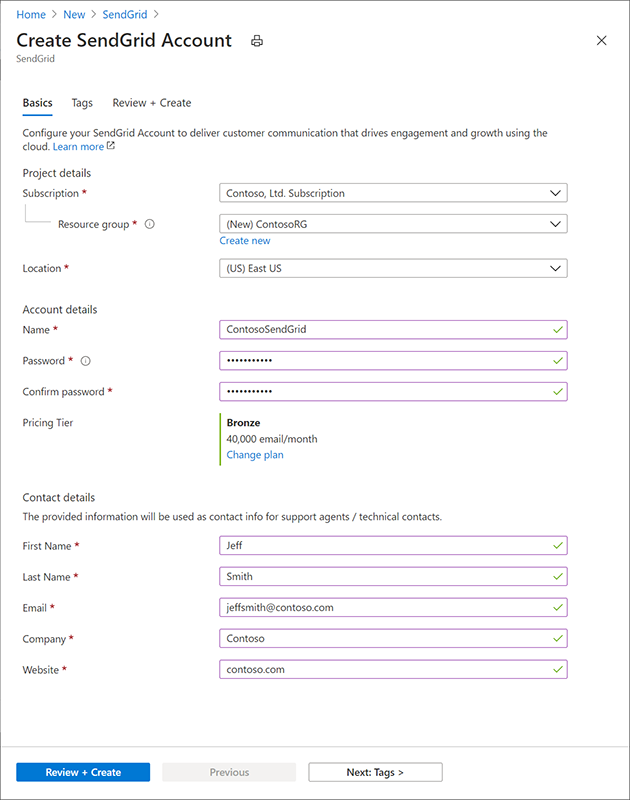 Enter a Name to identify your SendGrid service in your Azure settings. Names must be between 1 and 100 characters in length and contain only alphanumeric characters, dashes, dots, and underscores. The name must be unique in your list of subscribed Azure Store Items. Create a new Resource group or use an existing one. In the Pricing tier section select the SendGrid plan you want to sign up for. Review and accept the Legal terms. After confirming your purchase you will see a Deployment Succeeded pop-up and you will see your account listed in the All resources section. After you have completed your purchase and clicked the Manage button to initiate the email verification process, you will receive an email from SendGrid asking you to verify your account. If you do not receive this email, or have problems verifying your account, please see this FAQ. You can only send up to 100 emails/day until you have verified your account. To modify your subscription plan or see the SendGrid contact settings, click the name of your SendGrid service to open the SendGrid Marketplace dashboard. 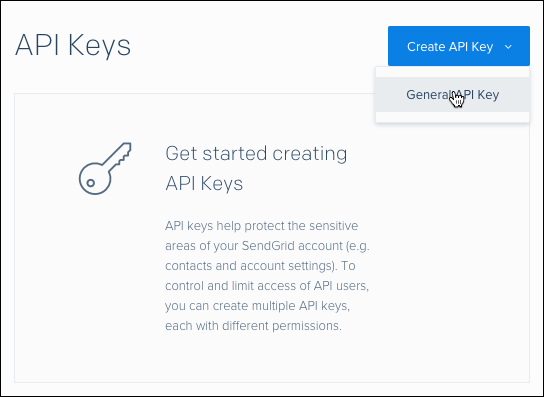 To send an email using SendGrid, you must supply your API Key. In your SendGrid dashboard, select Settings and then API Keys in the menu on the left. Click the Create API Key. At a minimum, provide the Name of this key and provide full access to Mail Send and select Save. Your API will be displayed at this point one time. Please be sure to store it safely. Click the key icon to find your Username. The password is the one you chose at setup. You can select Change password or Reset password to make any changes. To manage your email deliverability settings, click the Manage button. This will redirect to your SendGrid dashboard. For more information on sending email through SendGrid, visit the Email API Overview. The SendGrid module exports the SendGrid and Email functions. SendGrid is responsible for sending email through Web API, while Email encapsulates an email message. html: This is a sample <b>HTML<b> email message. Setting both the text and html properties provides graceful fallback to text content for clients that cannot support HTML messages. For more information on all properties supported by the Email function, see sendgrid-nodejs. After creating an email message using the Email function, you can send it using the Web API provided by SendGrid. filename:     '',           // required only if file.content is used. When using the files property, the file must be accessible through fs.readFile. If the file you wish to attach is hosted in Azure Storage, such as in a Blob container, you must first copy the file to local storage or to an Azure drive before it can be sent as an attachment using the files property. SendGrid provides additional email functionality through the use of filters. These are settings that can be added to an email message to enable specific functionality such as enabling click tracking, Google analytics, subscription tracking, and so on. For a full list of filters, see Filter Settings. For more information, see sendgrid-nodejs. 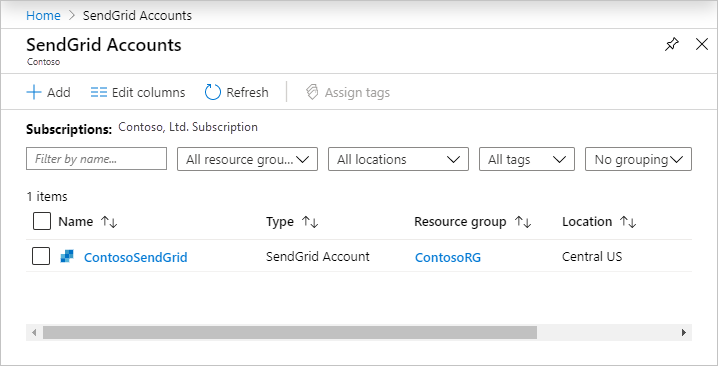 SendGrid offers web-based APIs that you can use to leverage additional SendGrid functionality from your Azure application. For full details, see the SendGrid API documentation. Now that you've learned the basics of the SendGrid Email service, follow these links to learn more.